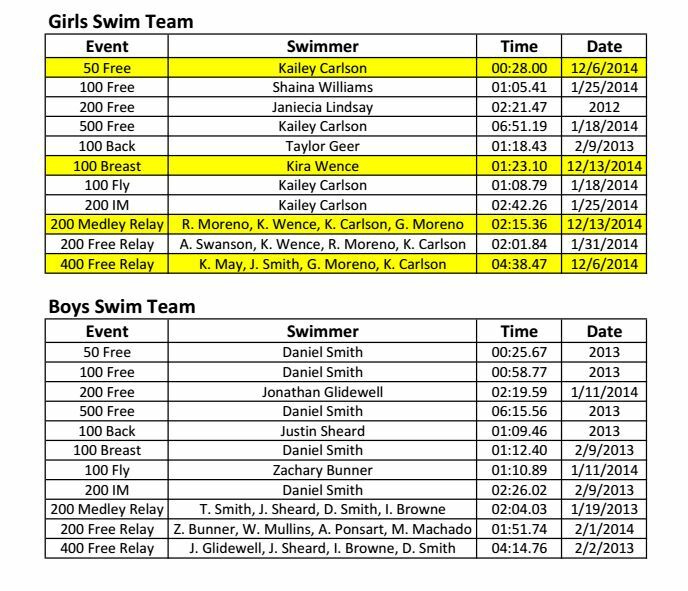 The MPHS Swim team has had a roaring season this year with a new record, winning two meets during the season. On Saturday, February 7th, the team travelled to the Collegiate Aquatic Center in Richmond, Virginia for the 3A regional swimming tournament. They competed against 15 other teams, with the girls coming in last place with 29 points, and the boys coming in 15th place with 19 points. Although the team didn’t gain the number of points needed to place higher, they still learned from each other. The MPHS Swim team started off the season with their first swim meet on December 6. This meet gave new swimmers and returning swimmers a chance to warm up to the new season. When the next meet on December 13th rolled around, everyone was revved up and ready to swim against George Mason and Central High Schools. Although it was 8:30 on a Saturday night, our swimmers swam hard, several team records were broken, and new personal bests were made. and Kira Wence for beating the record in the 100 Breastroke. to Keona May, Jessie Smith, Gabriela Moreno, and Kailey Carlson for the 400 Freestyle Relay. The Cougars put up a good fight and started off the season with a bang! “The force of buoyancy keeps you up, gravity pushes you down. The force of motivation pushes you forward,” is the true creed of our swimmers this year. Wednesday night’s volleyball game was an intense match between the grade levels and teachers. The first match was freshmen vs. seniors. The freshman played hard but unfortunately lost both sets of their matches. Match 2 consisted of sophomores vs. juniors, and once again, sophomores lost both of their sets. The juniors and seniors versed each other to decide who would play the teachers. After a harrowing match, the juniors defeated the seniors and advanced on to play the teachers. The winners of this game then played the Varsity Volleyball Girls Team and earn the title of champions. Surprisingly, the juniors defeated the teachers very quickly in their matches and moved on to verse the Varsity girls, and the juniors continued their streak and to beat the Varsity girls in an intense match. Overall, Wednesday’s volleyball game was a thrilling event that brought everyone together for a fun night! Photos Taken by Amy Henry. In the cornfields of Woodstock, Virginia, Manassas Park’s cross country team raced their hardest on Wednesday, October 1 against Central and William Monroe High Schools. This race was shorter than usual. Rather than the customary 3.1 miles, it was only 3 miles. With that .1 mile difference, almost the entire team achieved personal records. Top ten finishes for the girls went to Wendy Norman and Alex Dodson. The cross country team had their last home meet of the season against Strasburg and George Mason on Wednesday, October 8. Congrats to many of the runners, who not only far surpassed their previous times, but also displayed great sportsmanship both during the race and directly after. Scores have not yet been posted for this meet. This past Wednesday, running wasn't confined to the P.E. pacer for several of Manassas Park’s students. The MPHS cross country team traveled to Warren County to face district competition, Clarke and Warren county. Small, but mighty, the team had several individuals place and did exceptionally well in the fifth race of the season. For all you run-a-phobes, cross country races are usually 3.1 miles long(or 5 kilometers for you metric-ly inclined) and are often run on a variety of terrains. To put that into perspective, it is the distance from the high school to our lovely neighbor, Osbourn Park, times 3. Practices range from distance jogs to game days, and is the closest MP has, and will ever get, to an ultimate frisbee team. Sports coverage…it's all right HERE.